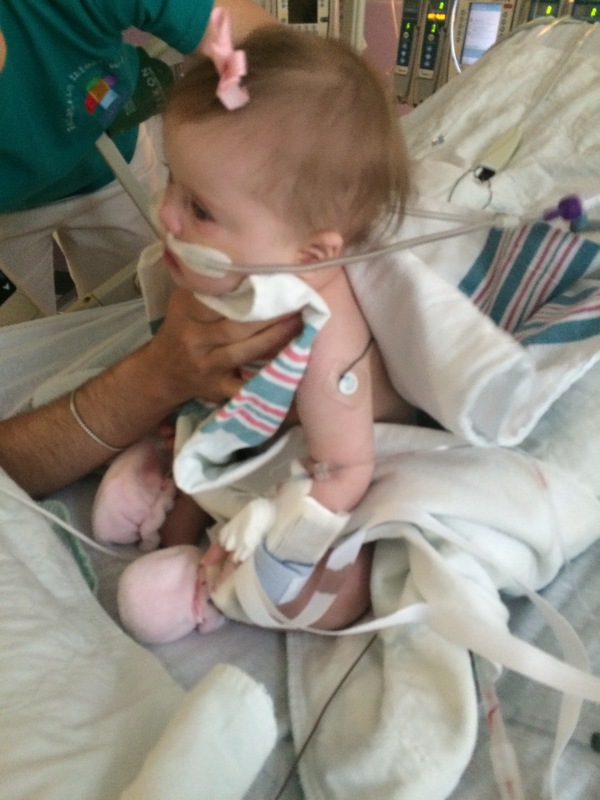 The stories of Hannah living with her heart defect and the surgery itself are better left for a day when I can give them the time they deserve. 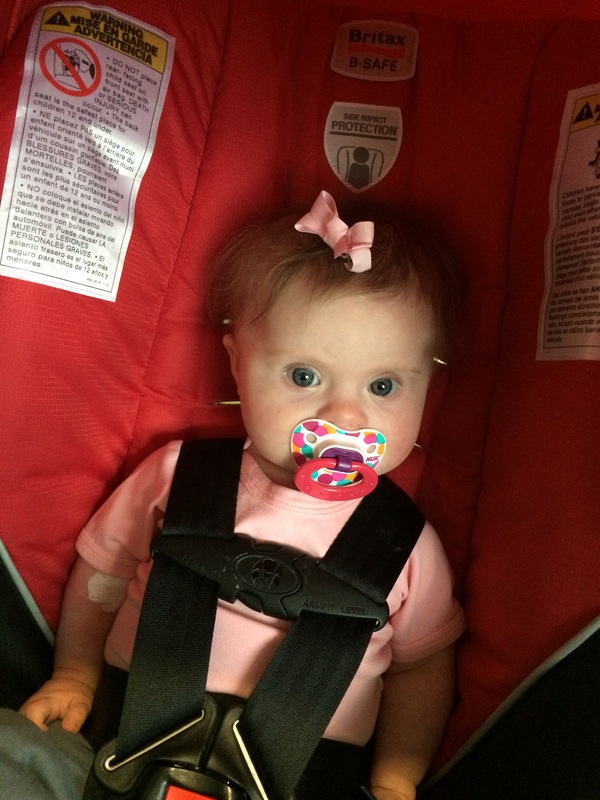 I refused to carry Hannah into the hospital in the car seat because I wanted to hold her for as long as I could. 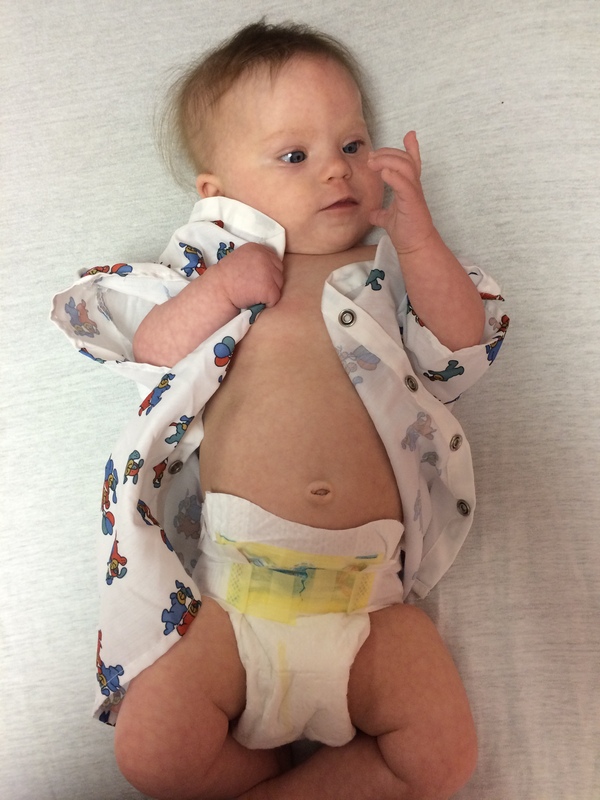 During pre-op we had to change her out of her jammies and into a kid sized hospital shirt that was way too big for her. She’d never looked so small and innocent before, just staring intensely at her hand. 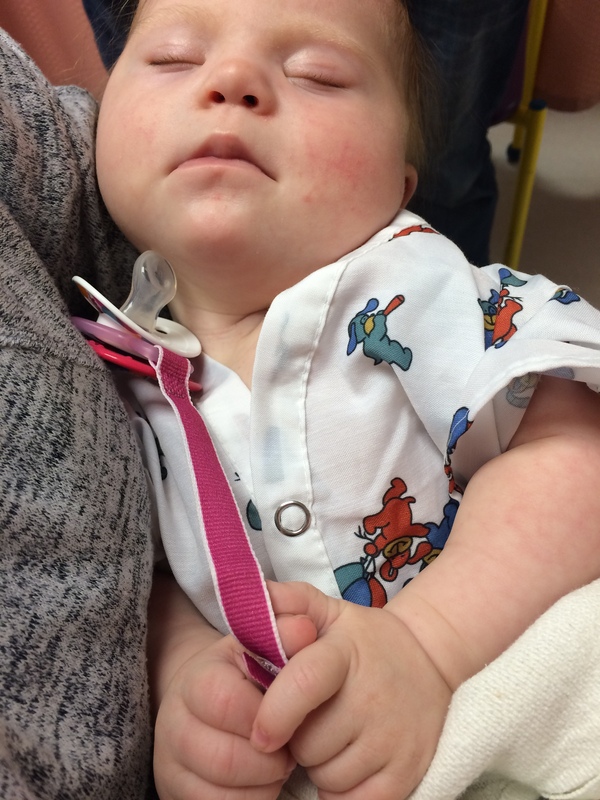 A female anesthesiologist assistant was sent to us to take Hannah, as if handing my baby over to a woman would make it easier. Hannah was sound asleep when I gave her to this stranger. Watching Hannah wake up from sedation might be the worst moment of my life. She was silently screaming, her face filled with terror and panic as she fought against the arm restraints. The nurse called for help because the situation was becoming an emergency. It was like a scene from a television medical drama when doctors and nurses rush into the room. Hannah wore a pink bow and booties every day. She smiled at every single person who looked at her. Even during 2 am chest PT and vitals. After only 6 nights we got to take her home. 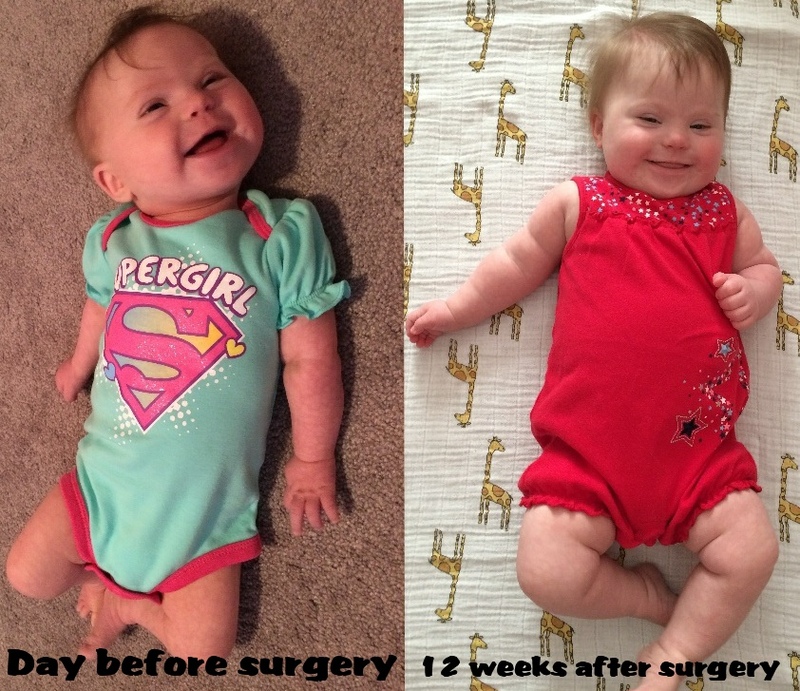 This past Friday marked 12 weeks since Hannah’s AV canal repair surgery. It’s amazing how time flies when you’re not looking for signs of heart failure. The week before the surgery we traveled to Virginia Beach for my sister’s wedding. We had the cardiologist’s approval for the long road trip and the wedding festivities were a welcomed distraction. It was the first time Hannah met my two brothers and most of my extended family. We were there to celebrate the union of two people in love but I was also celebrating the beginning of Hannah’s new life. The rehearsal dinner was in a private room at a local restaurant. I didn’t know most of the people in the room, only the bridal party and some familiar faces from the bridal shower., but everyone knew of Hannah. Hannah was a perfect dinner guest. She was quiet and there was an empty corner for her to play on a blanket. She loved to stare at her hands. There was nothing more marvelous than the back of her own hands. I had to interrupt play time to give Hannah her meds. Three times a day we fought with Hannah’s tiny mouth, tricking her into opening it, navigating around her tongue, trying different techniques to get her to swallow the sugary liquid. I fished through the diaper bag for the two bottles and a syringe. I always started with the easy one, the one that made her smack her lips for more. The second one had an artificial banana flavor that even made me cringe. I wiggled the syringe to the corner of Hannah’s mouth and released a drop or two. Rest and repeat. Rest and repeat. Rest and repeat. I suddenly became very self-conscious and wondered how many people were watching us. Sitting in a room of normal people with their normal lives I was giving my baby medication to delay heart failure. How did this become my normal? Counting grams of gained weight and milliliters of milk consumed. Listening for labored breathing and checking to make sure she was still breathing. EKGs, echocardiograms, and pulse oximetry. Waiting in exam rooms and waiting for a surgery date. Four long months of normal. One week after surgery we had a different baby and our normal changed. Hannah loves to eat and hates to nap. She refuses to snooze the day away when there’s so much playing to do. A few thirty-forty minute power naps are all she needs to feel refreshed and energized. Hannah would spend all day in the activity gym if she could. She rocks and rolls and flips and spins. She whacks and kicks her toys with force and pulls them into her mouth. Anything that goes near her mouth must be tasted. On Saturday while I was changing her diaper, my left hand holding her feet up, she pulled her feet towards her face, guided my forearm to her mouth, and gnawed on it like the world’s cutest zombie baby. When it is time to eat, at prompt three hour intervals, seven ounce bottles are guzzled faster than she used to laboriously drink three ounces. The hearty burps and belches are music to my ears. Her cries are loud and long-lasting now. Hannah’s first ever baby meltdown only lasted ten minutes because she didn’t have the energy to keep crying. It happened in the early evening and knocked her out until morning. The new Hannah can wail and, of course, the first time she showed us we were hanging out with friends. Forty-five minutes of shushing, bouncing, rocking, rejecting bottles and pacifiers, and sweating (me and her) for no apart reason. Four nights in a row. Poor Gamy was ready to move out. We’re fortunate she doesn’t demonstrate her new skills that often. Normal is easier now and much more fun. A heck of a lot chubbier too.